Thanks Dano. 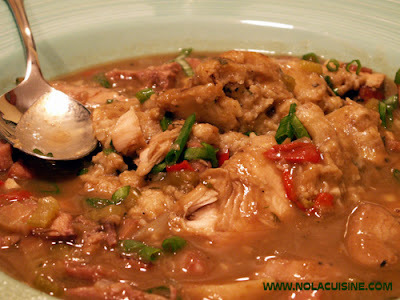 The turkey gumbo brings back memories of my childhood in the Irish Cannel in New Orleans and of my former classmate Father David Vavasseur from Port Allen, La. who considered Turkey Sausage Gumbo the highlight of the holiday season. May God bless you and your family during this joyful time. Too funny! I made Turkey and sausage gumbo this year from our leftover Thanksgiving turkey and also served it with leftover stuffing! I have friends in Eunice who serve theirs over potato salad, apparently that’s the Cajun way. If I weren’t so busy with school I might have posted my recipe too… I used the last good okra from the farmer’s market in ours; it’s too cold here in California now. I’m going to try to make daube of beef in a week or so… now that finals are over. Maybe just in time for New Year’s. After searching the web for gumbo recipes I settled on yours and was delighted with the results. I doubled the recipe and froze portions which was very convenient. Serving it over the stuffing was a natural. I am going to make more today along with the stuffing and it’s not even Thanksgiving. Thanks. I must be missing something, when do you add the remaining 1/4 of the Trinity? Also, is the simmering done covered or uncovered?